Scientists are finding Iowa darters in Illinois streams that are too small to map. 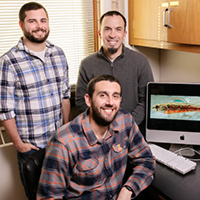 From left, Andy Stites, associate ichthyologist; Josh Sherwood, associate ichthyologist (seated); and Jeremy Tiemann, associate aquatic ecologist, Illinois Natural History Survey, with photo of Iowa darter. 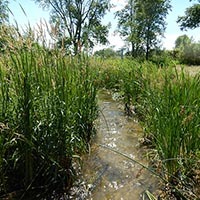 McHENRY COUNTY, Ill. – “Pull off in about a mile and a half,” I tell my colleague Josh Sherwood, an ichthyologist with the Illinois Natural History Survey. A minute goes by before he flips on the amber light bar over our heads and pulls the truck into the grass alongside the Jane Addams Memorial Tollway, about 60 miles west of Chicago. The ground is littered with trash, broken glass and bits of tire – like any major highway. A few feet away is a small, unnamed stream, barely more than 2 feet wide and less than 6 inches deep. 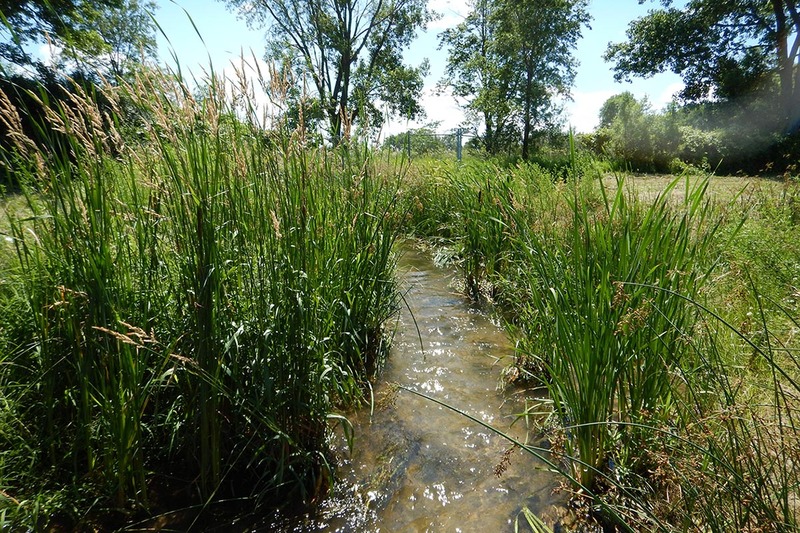 This stream in McHenry County, Illinois, is teeming with the tiny fish. Josh, INHS field biologist Jeremy Tiemann and I slip into our waders, grab our dip nets and hop into the water. We drop our nets into the stream and start sweeping water, rocks and sediment into the nets with our feet to try to catch any fish sitting on the bottom. In less than a minute, over the sounds of cars and semis rushing by, I hear Jeremy shout that he’s got one. Then Josh finds one. Then I do. For the next 15 minutes, we are finding Iowa darters where no one had looked before. This stream is full of them. 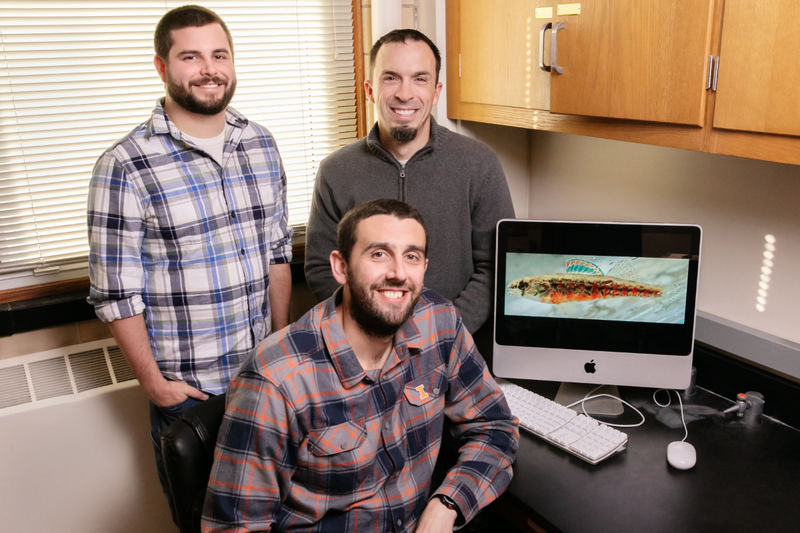 Researchers use fine nets to hunt for darters. This is not supposed to be happening. The Iowa darter is thought to be very rare in Illinois – remaining only in a few lakes in the northeastern part of the state. But not here, alongside a major highway in a stream so small that it doesn’t even show up on the map. Jeremy started noticing this trend a couple of years ago, and we decided to act on it. 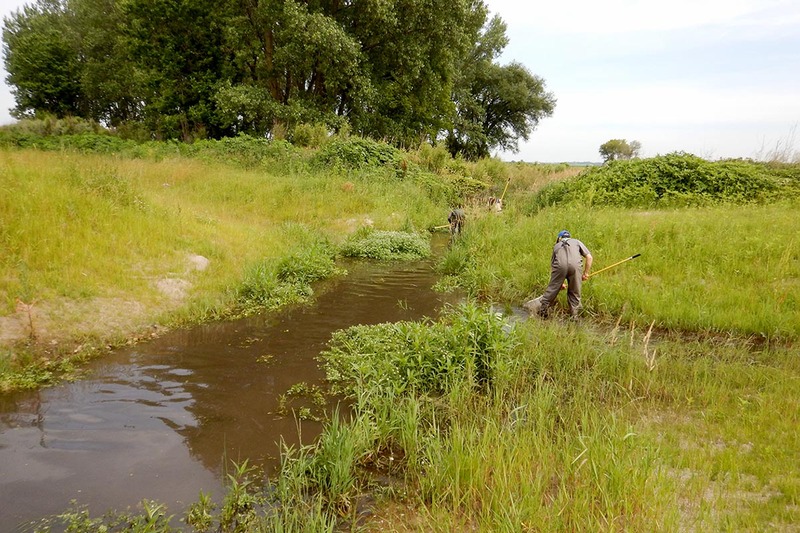 We’ve spent the last two summers sampling small, overlooked streams throughout much of the greater Chicago region, and our results are consistent. The Iowa darter is here and probably always has been. The fish has been hiding out in streams so small that biologists haven’t bothered to sample them. 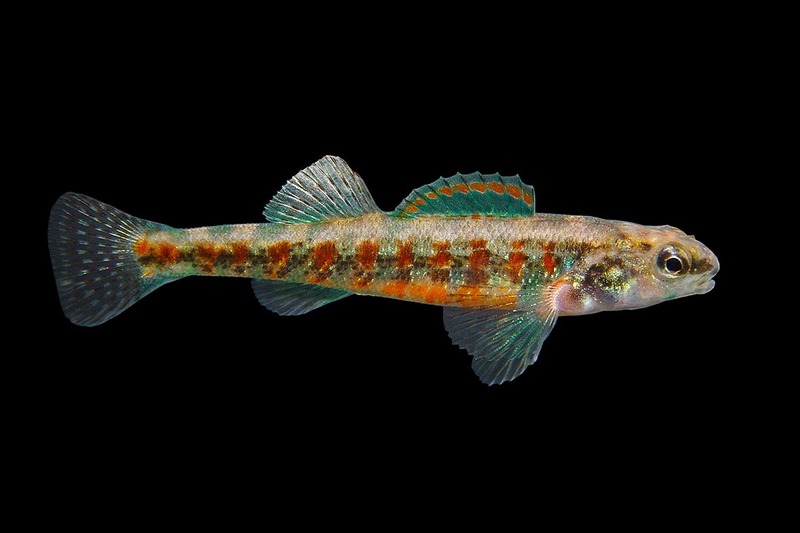 Now it appears that there are enough healthy populations in these small streams that this fish is in the process of being taken off the state threatened-species list. 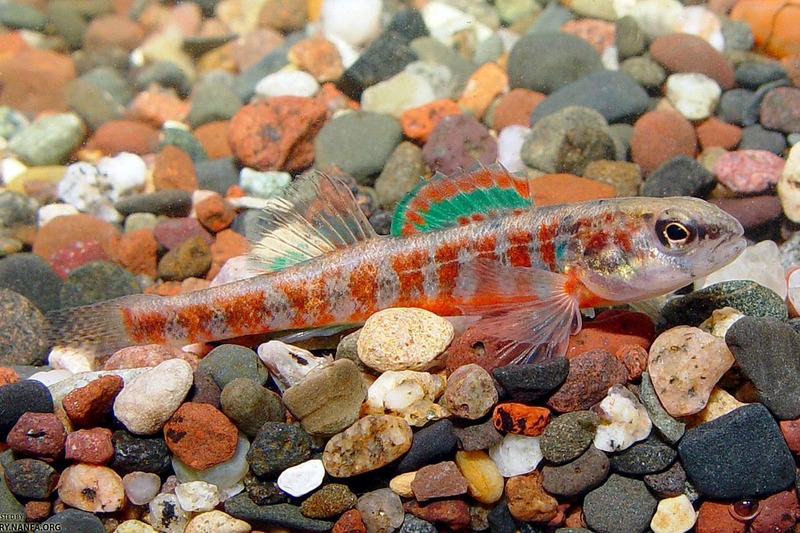 Thanks to new research, the Iowa darter may be delisted as a state-threatened fish. With our sample finished, we spend a few more minutes by the small Iowa darter gold mine, admiring the brightest colored individuals and snapping a few photos before loading everything back into the truck. 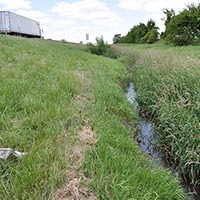 The interstate is a long road, and the next few miles still have unmapped, unnamed streams to visit and plenty more Iowa darters to find. The paper “Predicting the range of a regionally threatened, benthic fish using species distribution models and field surveys” is available online and from the author of this piece: stites1@illinois.edu. The paper was published in the Journal of Fish Biology.